Halifax coach Richard Marshall has said Sunday’s Challenge Cup clash with Super League outfit Widnes at the Shay (3.0) is a “genuine opportunity” for his Championship part timers to spring a shock. The Vikings, who set the early pace in Super League, arrive in town on the back of league losses with Warrington and Wakefield. They will be without winger Patrick Ah Van and centre Stefan Marsh through suspension, while star stand off Kevin Brown has missed the last two games through injury, although Marshall has not ruled out the possibility of him appearing at the Shay. “It’s a genuine opportunity, just as the game against them last season in the Qualifiers was,” said Marshall, whose side lost that fixture 14-0. “I am not quite sure what kind of team they will put out, but we just need to prepare to play their best team. “All the pressure is on them this week, I think most people will expect us to get beat. “We have a habit of raising our game against the better teams, which is a double-edged sword from a coaching perspective, and we’ll certainly need to do that again on Sunday. “I’m not sure whether Brown will play; he’s missed a couple, but they might see this as a game to ease him back in, I don’t know. “What we need to make sure we do is meet them physically on our terms, rather than being dictated to. “We’ve had some defensive issues and I think that’s a big part of it; we need to impose ourselves more, be a bit quicker, more aggressive and defend on the front foot again. “We want to entertain, we want to be flamboyant with the ball, but we need to that on the back of some hard work. “We did it last season and we’ve done it at times this year, but not for a full game. 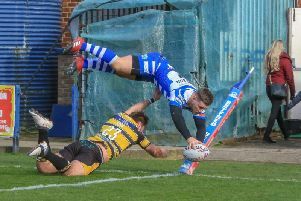 The search for that intensity has already cost Fax the services of one player, with prop Luke Ambler ruled out after being concussed in a “tough” session on Tuesday night. Another front rower, the Australian Mitch Cahalane, will also miss at least one week after being stretchered off against Workington last weekend. “It’s not ideal, going into a game like this without two of your best middle players,” said Marshall. “We needed a physical session on Tuesday and unfortunately Luke took a knock during that. Marshall named Adam Robinson and youngster Elliot Morris as potential deputies, but added that both centre Ben Heaton and utility back Connor Robinson could have roles to play. “We’ve got a couple of other injury issues, so we’ll see how those players respond and how the team train,” said Marshall.